Cycling as a spectator sport is unique in many ways. To attend an event is to make a day of it. In France, as the riders zip by, those roadside have been sat in the ditch or under a tree for several hours. Anticipation builds when the thumping of hovering chopper blades can be heard. It’s about that time to put the bottle of wine away, get the noisemakers out, and prepare for a couple minutes of pageantry. Part of watching a professional cycling race on television is deflecting attention to the background. Of course there are the castles shown by French chopper pilots. Those same pilots parallel the Pacific Coast Highway during the Tour of California. When the riders hit the climbs, observing the fans helps speed up the long inclines. And what would the Spring Classics be without the sideshow that is – well – on the side of the road? Being in the comfort of one’s own with cycling friends can be a bit of a challenge to express one’s affinity for riders or teams. Bringing noisemakers into the house is going to be fun for all of departure. Unless remaining outside, unfurling a replica ‘Tornado Tom Frites’ sign in the living room is counterintuitive to the passage of the Arenberg Forest. I don’t believe I need to outline why flares are a bad idea at a Roubaix viewing party. Belgian Crew goes the extra length to sew labels onto their crew shirt. Cycling does not translate to the stadium sports. Sure there are professional cycling jerseys the weekend warrior can purchase, but to wear a Lotto-Soudal jersey to the market might be rewarded with confused glances. So how to wear cycling fan gear? Belgian Crew has the Spring Classic season covered. To some it is simply a t-shirt. To the cycling crowd it is more than that. What it is not is an event tshirt. Considering I never graced a podium I hardly wear the team podium shirts. The Crew T-shirt is something a bit more special. It’s that shirt you wear after a wet shave in the morning and drinks with the team at the local pub for the viewing party. 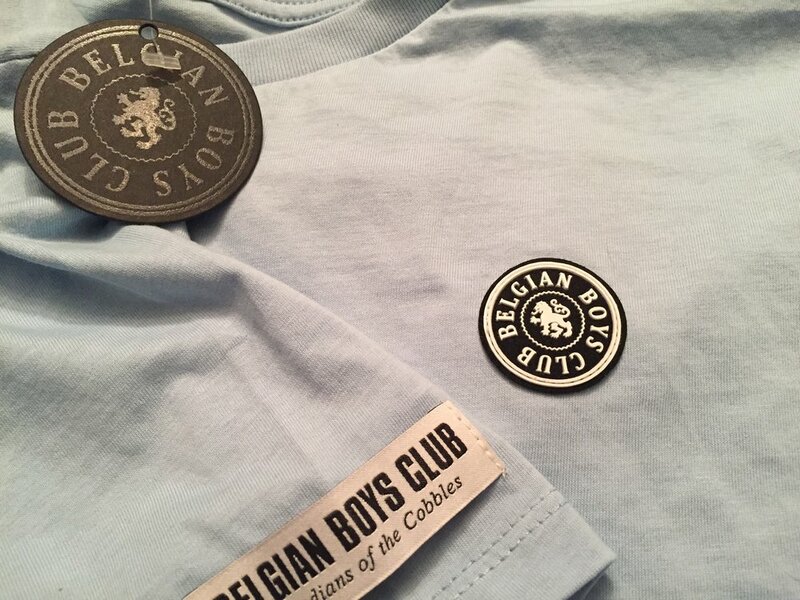 We opted for Belgian Light Blue to stand out subtly. Those who have crossed the pave secteurs will notice the detail and nod in approval. We may not have had our palms rubbed raw but we would go if given the chance. That’s what wearing this shirt says. It has been a long time coming for après-cycling wear to stay ever so subtle yet sport nuances to grab other fans’ attention. It is more than just a cotton shirt with sewn on logos and a reflector stripe in the back. It is a Euro statement that foggy spring days in the countryside are the exciting, especially if the stones are coated in slight sheen. Wearing the Belgian Crew T-shirt signifies that the Spring Classic season is right around the corner. In a few months’ time the t-shirt will be the go to garment for putting the feet up to recover for the Grand Tour season. In the meantime, get this tailored shirt. It will be as close to wearing a Tom Boonen jersey as one could get.